Inspiration comes in all shapes and sizes. You really never know where you will find it or what it shall be or what it might produce. It could change the fate of all humanity or it might get you to draw a pointless doodle which causes a smile. Also, thanks to Virmir, we now have a shoutbox to the left there. It is shiny and snazzy and it doesn't require you to have a forum membership. (Not that you should avoid a membership on the CF forums. There be fuzzy peeps there. And they don't bite. Much.) 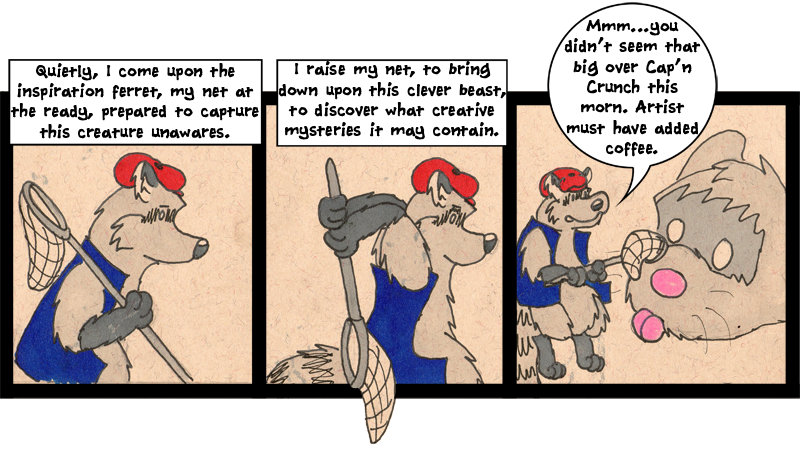 Feel free to comment on the comic, on my art skillz, or on random other topics of interest (perhaps w/ ferrets).